For us - the two geriatrics - the past 10 days have seen an excruciatingly frustrating nail-biting series of doings and undoings with the bureaucracy in Malaysia. "Some third person decides your fate: this is the whole essence of bureaucracy," - Alexandra Kollontai 1872-1952. 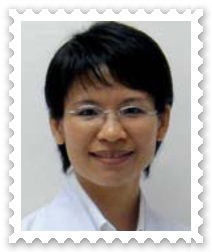 But more upsetting for us is the loss of Assoc Professor Huang Shih Ying - our acupuncturist from Tung Shin Hospital - when she returns to Taiwan at the end of October. For the past three years,she has treated and mended my joint and respiratory maladies. She has always managed to tweak me back to normalcy over my insomnia and fatigue syndrome. Part of her treatment comes from her caring and kind demeanour. When she enters the room, you get a bright smile. With her hands folded close to her chest she gives you a courteous bow. She remembers the problems you had the previous week and makes an inquiry about your progress. Always very encouraging, Prof Huang reassures you with "I will try my best". And she has never failed to do so for the spouse and AsH! And after inserting up to 30 needles all over the parts of you that western medicine cannot reach, she leaves you with "Now you rest, Aunty" or "Uncle, you rest now". However, Prof Huang from Taiwan (ROC - Republic of China) offers the best that Chinese medicine and Chinese culture can offer. She takes away the nasty odour that Ambassador Huang Huikang and his Malaysian Chinese brethren leave in the mouth. We will miss her very much: Professor Huang the acupuncture specialist and the ideal Chinese Ambassador. 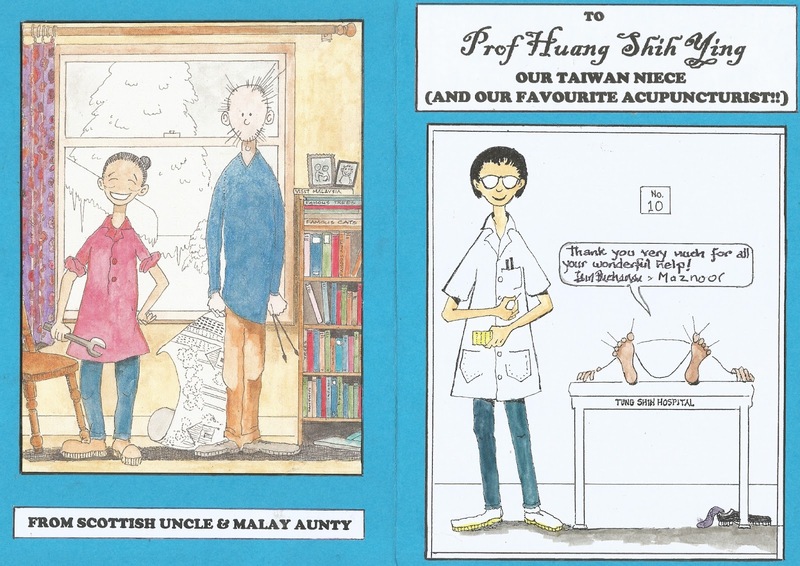 The spouse made this farewell card for our "Taiwan niece". She had to run back to her office while exclaiming "this is very unprofessional conduct" because the card left her in tears. She came back a minute or so later to attend to us and left us with the usual comforting "Rest now, Uncle/Aunty". She is indeed a wonderful professional. She treated my Mom when my Mom had a stroke last May. I was the primary care giver and, try as I did, I simply wasn't my normal collected self. She was patient, kind and considerate. She did a good job with Mom. Mom is recovering well now, in no small part, due to Dr Huang's loving hands. God bless her. My Mom and I are both grateful and thankful to her. AsH are you ok? Its been a while since your last writing. Hope you and Ian are ok.
We've been on some rather rocky roads -but we're coping - just. Am touched by your query. Take care. China's 'Daughter' in the Pariah State.